Are you looking for Microsoft Word-like text editing and document formatting capabilities for your WinForms applications? Look no further - the WinForms Rich Text Editor delivers fast and robust text and document processing abilities to your desktop applications. It will provide you with more powerful features and even better performance than MS Word or any other word processing control. The NOV WinForms Rich Text Editor is an advanced text processing control designed to provide developers with an easy-to-use, professional WYSIWYG content and document editing capabilities. It comes with WinForm Example Solution including many Text Control examples with source code. 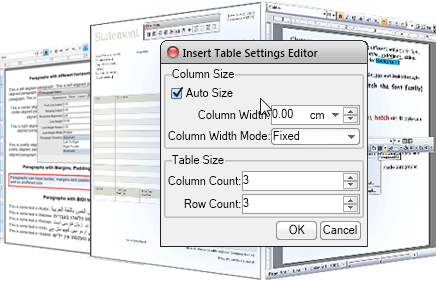 You can use the WinForms Text Editor to replace any TextBox/TextEditor control for your business applications, whether you are working on a new or extending an existing Windows Forms application. The NOV Rich Text Editor will not only help with your WinForm application development, it will also allow you to start with your cross-platform .NET development and target multiple platforms and devices.